Hello Sunshine! Hello sunshine! For the past few days I've been giving the Belo BB Body Cream* (Php 399.75) a try and so far it's been pretty interesting. When I first heard of this product, I thought "Oh cool, this is new." but I really didn't have any clue on what to expect of the product. I don't use body makeup because fortunately, I don't have a lot of scars that I need to conceal... but if I can be flawless in a flash, why the heck not, right? Thank you Sample Room! 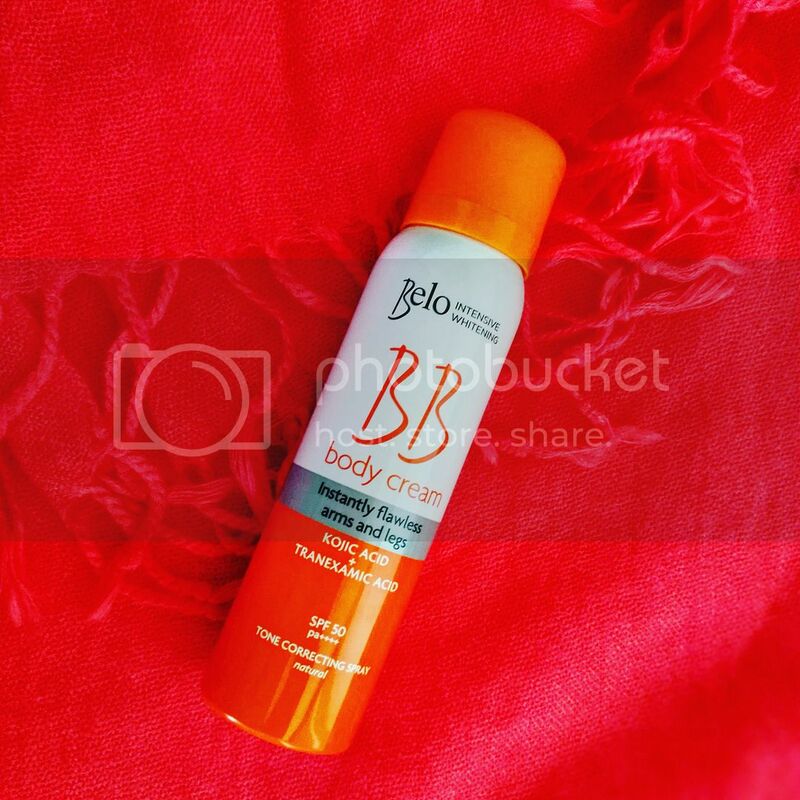 Belo Intensive Whitening BB Body Cream visibly conceals as it whitens. It adds buildable coverage to conceal imperfections like a BB cream would; while its intelligent mix of tone correcting formula: Kojic Acid, Tranexamic formulation, and its SPF 50 & PA++++ helps protect the skin against age-accelerating UV rays. Using the product is very easy. I sprayed generously as I would using any aerosol skincare product. Really close to home, I used it as I would use the Belo Sunblock (the spray type). The mist is very light and initially it would be a very transparent layer, but as you continue to spray on the product, you would see a film of the Belo BB Body cream on your skin. When this happened, I stopped and went on spreading the product evenly on my legs. If you use BB cream for makeup, then you're probably expecting that the product might have a medium to heavy coverage. However, for the Belo BB Body Cream, it starts on the really light side. After I spread the product, my legs were visibly smoother. I don't have scars to cover, but I have dry flaky skin lately, light lang pero if you look closely kita talaga, and after applying the product, smoothness! It's also not just visible smoothness. You can also feel that your skin feels silkier. Nakakagigil haplusin. The product is only available in one shade, though. I would consider the product to be on the fair to light skin tone spectrum. If you have medium to dark skin tone, I'm not entirely sure the Belo BB Body Cream would be a fit shade. Sorry! Belo Intensive Whitening BB Body Cream is also paraben-free, hypoallergenic, and dermatologist-tested. PAK! Read more reviews on SampleRoom.ph! For more information about Belo Essentials products, like them on Facebook.